Istiklal Avenue in Istanbul is a busy street. In fact, it is the busiest street in Turkey. Also known as Istiklal Caddesi in Turkish or Independence Avenue in English, anyone visiting the city should spend at least a day exploring the 1.4-kilometer Street and all the side alleys leading off it. The street is busy from morning until night, and not only is it immaculately clean and uniformed but buildings have a historical tale to tell that mostly relates to the Ottoman era. Often frequented by dignitaries, intellectuals and people of affluence, the cosmopolitan street was the place to hang out. After the Turkish war of independence in 1923, it was renamed Independence Avenue but by the 1970s, neglect had turned the street into an undesirable area. In the 1990s, Istanbul local council decided to do something about it, to the tunes of millions of dollars and that work bought it to the influential status that it has today. So when you visit the street, where should you go and what is there to do? There are a few churches in this area, but the biggest and best is the St. Anthony of Padua Church. The Venetian Neo-Gothic architecture of the inside is impressive. The church is a fully functioning place of worship for Christians that live in a predominately-Muslim country. 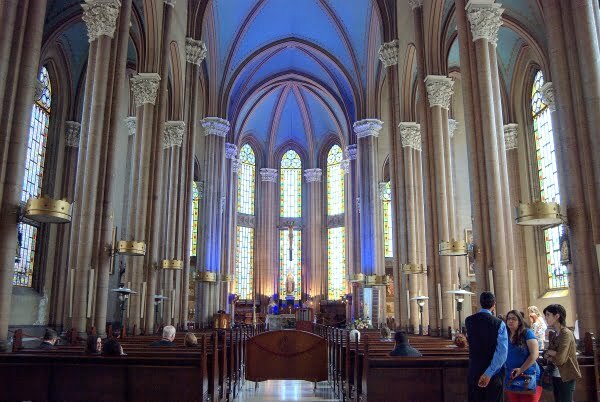 If religious landmarks interest you, then you may also like the Spiritual Sunday Excursion by Istanbul Tour Studio. It visits major churches, mosques, and synagogues of Istiklal Avenue and the neighborhoods surrounding it. Understanding the multi-cultural history of Istanbul is hard at times, but this is a perfect way to see and understand how various religions have shaped its history over time. It is so easy to empty your bank account with everything that is for sale including clothes, music, technology, home décor, sports, and perfumes. Many shops are chain store brands so you can’t bargain over prices. Instead wander down side streets to find local shopkeepers who sit down with you, drink an apple tea, and discuss the price you want to pay, in the traditional Turkish way of haggling. The Mevlevi Museum is a former lodge of the whirling dervishes of Istanbul and displays of their clothes, instruments, and reading books are open to the public. They also hold whirling dervish shows in the side hall that showcase the ancient Sema ritual. This museum is a great insight into the Sufism sect of Islam and Rumi, also known as one of the greatest poets in the world. The Independence Monument stands in Taksim Square. A reflection of the Turkish war of independence, many Turks hold it in great esteem. First erected in 1928, estimations say that at weekends, up to 3 million people walk past this statue. On back streets surrounding Istiklal Avenue, art galleries such as the Pera Museum and smaller exhibitions such as the Misir Apartmani in the Galata district, showcase up and coming artists, both international and Turkish. 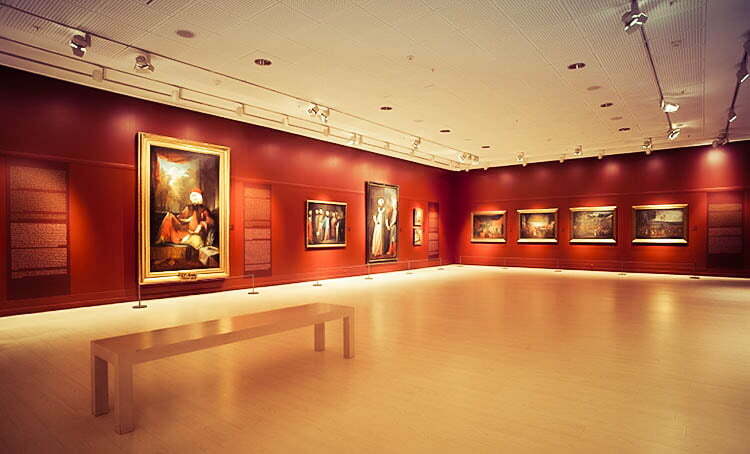 Istanbul Tour Studio run a walking tour and you can read more about it here but most importantly is that the Pera Museum is also home to one of Turkey’s most expensive paintings that is the tortoise trainer by Osman Bey Hamdi. If art interests you but you don’t want to walk around galleries, then the street art tour might be more suitable. 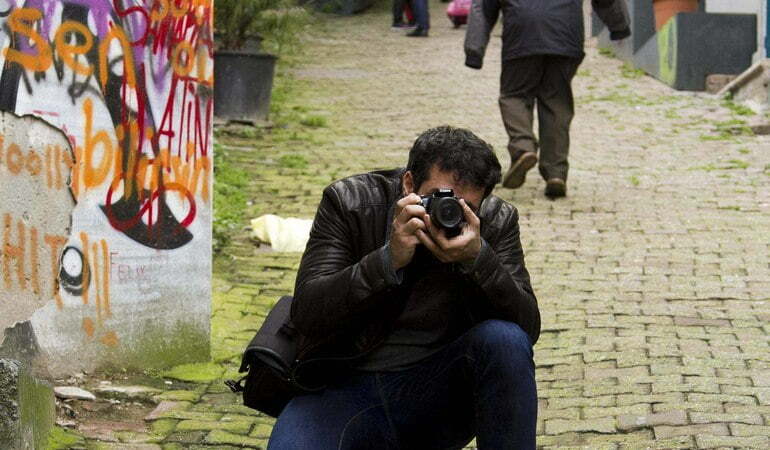 Istanbul Tour Studio offers this unique insight into one of Istanbul’s most urban districts by highlighting the work of famous street artists. 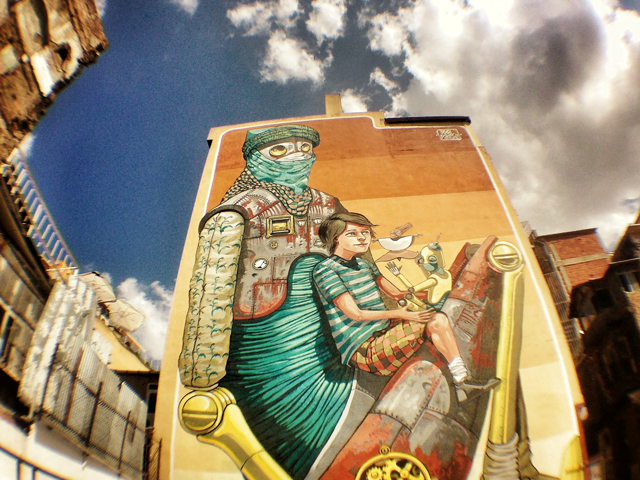 Led by a local artist who has also collaborated on a street art app for Istanbul, the tour starting on Istiklal Avenue, then ventures further into other surrounding neighbourhoods. Read more about the itinerary here. Eating and drinking your way down Istiklal Avenue will take months because of the huge range of establishments open for business. Well-known western chains of fast food such as Burger King or KFC make a roaring trade with youngsters and partygoers, or alternatively, traditional Turkish lokantas serving cheap Turkish food are great if you are traveling on a budget. Likewise, high reputation restaurants serving pricey food often require a reservation in advance. Night-time is when the action happens as the bars liven up and play every type of music from traditional Turkish rock to western style group bands. I’ve never been, but one of the most popular and highly rated nightlife scenes is the 360 restaurant /bar and a nightclub. Set in a 19th-century building, it apparently also has a 360-degree view of the Istanbul city horizon. Instead, I found myself in some dingy bar, popular with students, and I highly suspected the singer was out of his head on drugs. So naturally, as you would anywhere in the world, just have your wits about you because as one of the major players on the nightlife scene in Istanbul, there are some dodgy characters about. Flower Passage (Cicek Pasaj) is a favorite venue at night-time for food, but I did not rate the disgusting culinary dish that I sampled. Instead, the architecture on the first level of buildings interested me the most. 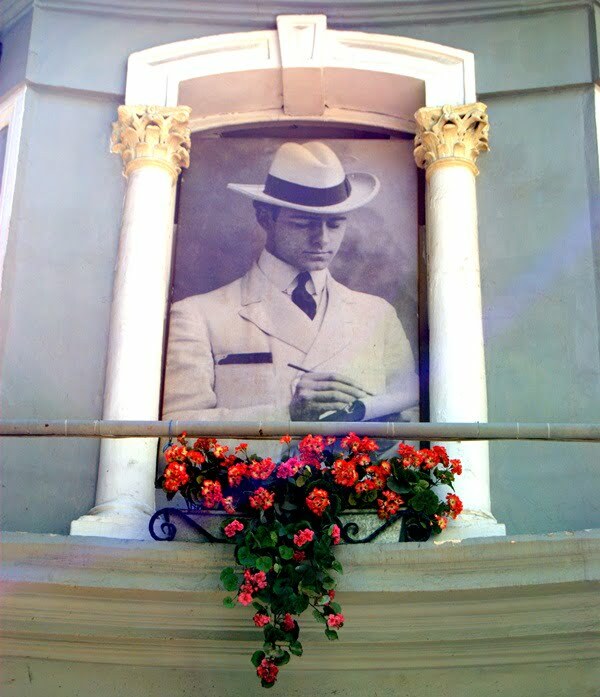 Displaying profile pictures from old managers of Meyhanes in Flower Passage, it was a striking and nostalgic black and white display of prolific Istanbul locals. 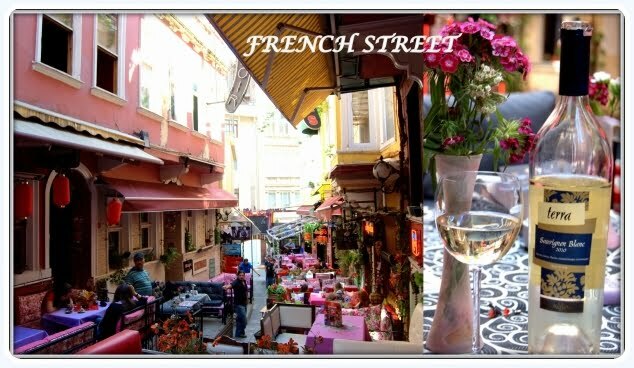 French street is on a small side street leading off Istiklal Avenue but is worth going that extra distance. Now a local landmark and popular with tourists, the décor is typical of a street in France, but don’t expect French food or handsome French waiters! Live music played during the summer months provides a romantic atmosphere, while it is open all year for food or just drinks. Note: Also, get ready for demonstrations. 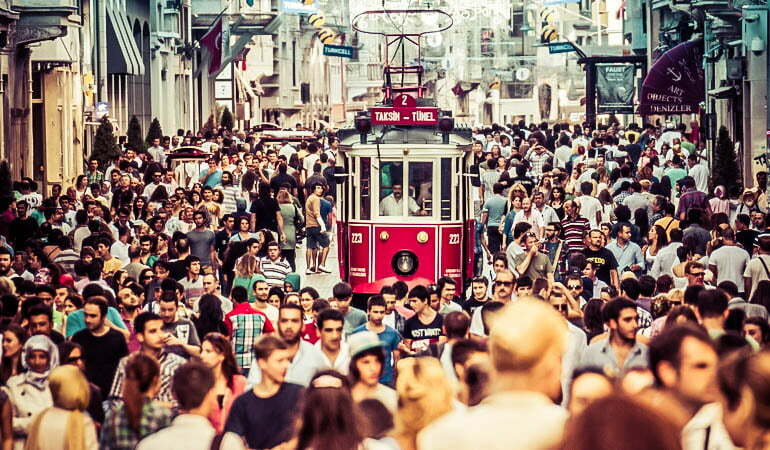 In Istanbul, if people have something to say, Istiklal Avenue is normally where they do it. The most famous event was the Annual Gay Pride march of Istiklal Avenue that more than ten thousand people attended in 2012. Now in previous years, most protests were peaceful but unfortunately, that has changed recently, and water cannons are commonly used to disperse protesters. So if you are on Istiklal Avenue and see a demonstration, walk in the opposite direction. 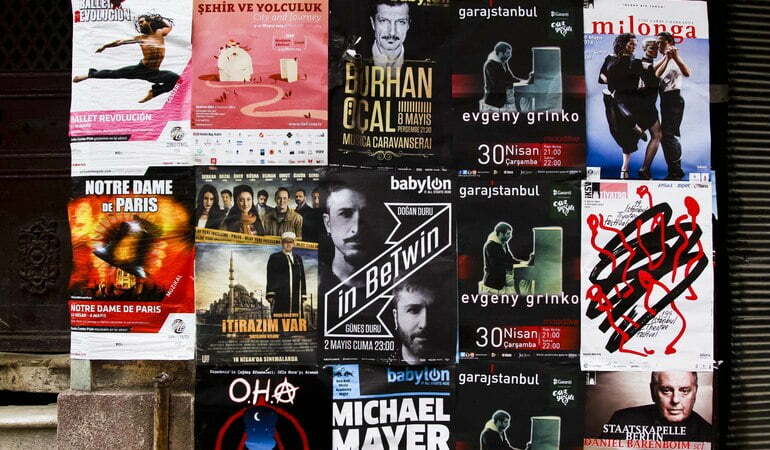 Readers Question: Can you recommend any more things to do on Istiklal Avenue in Istanbul? Some great photos of Istanbul. I love istiklal caddesi – so much great people-watching! I have been to Ataturk airport only for hours on layover, but I have never made it into Istanbul. This is great information for the day I finally get to venture out. What time does Istanbul shut down for the evening? I often wonder how you are getting on Jack and whether there are any withdrawal symptoms! And then there’s the nightlife – fabulous! The good, the bad and the ugly. I’m feeling homesick just thinking about it!